Hand tools can often be overlooked in favour of the vast array of power tools on the market for speed and convenience, however, hand tools are the bedrock of woodworking, so it is always good to reacquaint yourself with the basics. at the bottom end of this market, there is good choice too. Such tools should be fit for purpose and, in the right hands, capable of good results. So, I put down my router and picked up Faithfull's No.04 Smoothing Plane. This plane arrived in a highly finished, green and flock-lined presentation box. The plane has the familiar basic design. The grey iron castings are pretty substantial and even in thickness. The machining of all surfaces looks good, and the plane was reasonably well set up at the factory. 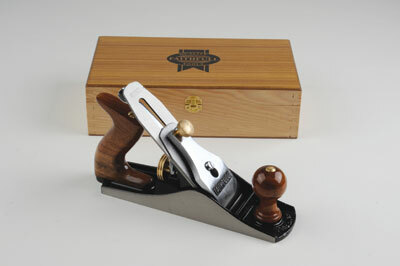 The use of brass and highly finished hardwood handles completes the impression of a tool that has been well turned out. I wouldn't dream of trying to plane straight from the box. No matter how much you pay for a plane, assume you will find fault somewhere. I used a straightedge and engineer's square to check the sole and sides. As expected, the sole wasn't flat - not a serious problem with a short base smoother. The back of the blade also needed flatting with 400 grit emery stuck to our cast iron planer table. The blade received the same the treatment using three grades of diamond plate, both on the bevel and the flat side, and a white Arkansas stone to give a semi-mirror finish. I ground it flatter until it felt right. The blade assembly went together easily and the brass milled knob is preferable to a lever cap iron. 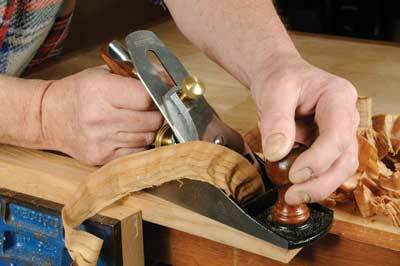 After set-up, I cut some very solid shavings, followed by lovely finer ones. We always moan about the falling quality of blade steel, but it works surprisingly well and was perfectly adequate. Overall a good workshop or site tool, that won't let you down. And for the price, a great bit of kit.